It’s 3am. Your baby didn’t settle until 11pm. Now they are just crying. And crying. And crying. You are soooo tired but if you so much as sit down the decibel level increases tenfold. How do they even know? I’m still jiggling around but somehow the 2 foot descent provokes screams of despair. Bleurgh. We’ve all been there. For most of us it’s in the first months, or when our children are teething or ill. For those of you who endure this nightly for more than 6/12/18 months, we salute you. Hang in there! I don’t know about you but when my baby has had a few atrocious nights I start to feel quite mad. The depleted brain function caused by sleep deprivation is coupled with a nagging mental search for the cause of this nocturnal malfunction. Is something they ate? What have I done or not done to cause this??? Double bleurgh. 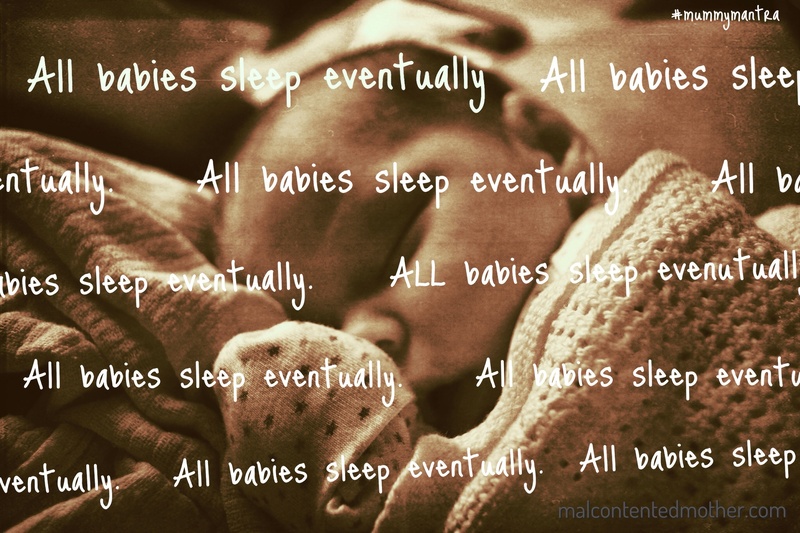 When your mind is thus befuddled it may help to repeat this simple phrase: all babies sleep eventually… This little mantra works on two levels. 1) No human can fight sleep forever (though it sometimes feels like it) and so you can rest (or not) assured that at some point the crying will give way to that adorable sleepy face. You know the one, it makes you remember how cute and lovely they are. It may not last as long as you want, but sleep will happen. 2) I don’t know any 18 year olds who still wake 4 times a night demanding milk/cuddles so when you say ‘all babies sleep eventually’, you can be telling yourself that the night waking won’t last forever (I know for some it lasts far too long though). Every baby insists on having these battles with sleep even though, as I often tell Bubs, this is only time in their lives when they can literally go to sleep whenever and wherever they want (it’s like, duh, take advantage!). To call this a bit frustrating is a bit like calling Ryan Gosling mildly attractive; it just doesn’t cut it. But we get through. So as you sit (if you’re lucky) rocking back and forth in the corner of the nursery, you can repeat this mantra for some reassurance. Or even just for something else to listen to! Yes, you will look ever so slightly insane, but hey, it’s 3 am, who’s watching? FYI: This post is dedicated to my own mother. I woke every two hours, every night until I was 9 months old. And she was a single parent. So. Much. Bleurgh. Sorry mumsie! Want (mal)contented mother straight to your inbox? Sign up in the top right corner of my sidebar. ← Mummy Mantras #3: We do what works! Oh, my boy is better than a lot of babies his age, he even sleeps through quite often (famous last words!) but when they’re not sleeping it feels like they never will doesn’t it??? Thanks for the comment and follow!